THE jolly season is here, but certainly not for football. Football is at its lowest ebb, at international and domestic levels. But let’s not talk about the national team, especially after their dismal performance at the AFF Cup earlier this month. Let’s look instead at our domestic league, which should be the foundation of our national team. It’s in a mess despite the game having been played competitively since 1921, with a transition to semi-professionalism in 1989 before going fully professional in 1994. Even the fact the league is managed privately by Football Malaysia Limited Liability Partnership (FMLPP) has not solved anything. In fact, it has plunged it into more controversies and complications. The appointment of MP & Silva, a leading international sports agency, by the FA of Malaysia (FAM) as its global advisor on media and commercial rights, with the goal of extending its broadcast reach and maximising the commercial potential of its properties for 15 years, was seen as a great move. But in less than a year from its start, the marriage between FAM and MP & Silva is on the rocks and headed for divorce! To make matters worse, Kelantan, Perlis and Selangor are contemplating withdrawing from the league if they cannot secure funds to manage their teams. Do these teams realise a pullout will bring a total ban and a fine by FAM? 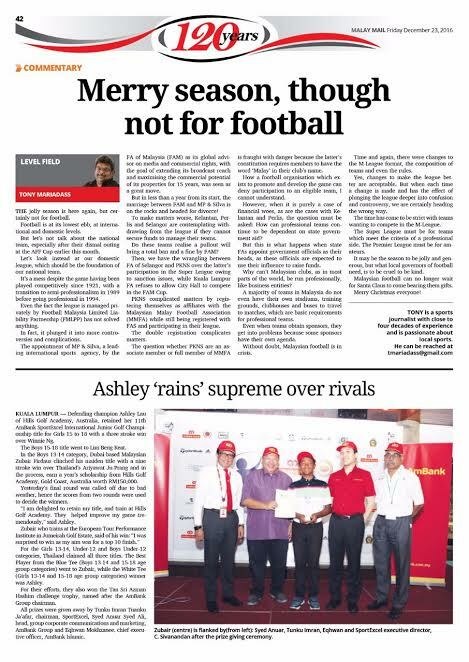 Then, we have the wrangle between FA of Selangor and PKNS over the latter’s participation in the Super League owing to sanction issues, while Kuala Lumpur FA refuses to allow City Hall SC to compete in the FAM Cup. PKNS complicated matters by registering themselves as affiliates with the Malaysian Malay Football Association (MMFA) while still being registered with FAS and participating in their league. The double registration complicates matters. The question whether PKNS are an associate member or full member of MMFA is fraught because the latter’s constitution requires members to have the word ‘Malay’ in their club’s name. How any football organisation which exists to promote and develop football can deny participation to an eligible team, I cannot understand. However, when it is purely a case of financial woes, as are the cases in Kelantan and Perlis, the question must be asked: How can professional teams continue to be dependent on state government aid? But this is what happens when state FAs appoint government officials as their heads, as these officials are expected to use their influence to raise money. Why can’t Malaysian clubs, as in most parts of the world, be run professionally, like business entities? A majority of teams in Malaysia do not even have their own stadiums, training grounds, clubhouses and buses to travel to matches, which are basic requirements for professional teams. Even when teams obtain sponsors, they get into problems because some sponsors have their own agenda. Without doubt, Malaysia football is in crisis. Time and again, there were changes to the M-League format, the composition of teams and even the rules. Yes, changes to make the league better are acceptable. But when each time a change is made and has the effect of plunging the league deeper into confusion and controversy, we are certainly heading the wrong way. The time has come to be strict with teams wanting to compete in the M-League. The Super League must be for teams which meet the criteria of a professional team. The Premier League must be for amateurs. It may be the season to be jolly and generous, but what local governors of football need, is to be cruel to be kind. Malaysian football can no longer wait for Santa Claus to come bearing them gifts.